Good Shepherd Church was born out of two Uptown New Orleans congregations merging under the direction of the Rev. Fritz O. Winckelman. The two churches, St. John Evangelical & Reformed and Bethany Evangelical & Reformed, were E&R congregations who both joined the United Church of Christ at its formation in 1957. 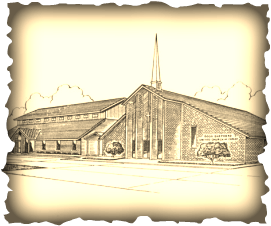 In 1976, the two churches came together as one and adopted the new name, Good Shepherd. They subsequently sold their two church properties in New Orleans, using the proceeds to purchase the tract of land in Metairie where Good Shepherd now stands. The combined congregation worshiped in the cafeteria of Harold Keller Elementary School on Irving Street in Metairie for 4 years while the Good Shepherd sanctuary was being built on West Esplanade Avenue. In 1980 Good Shepherd moved into the current church building on West Esplanade under the leadership of the Rev. Allen Hollis. In 1986, the Rev. Richard A. Carse oversaw the addition of the Fellowship Hall as well as a refurbishing of the sanctuary. In August 2005, Good Shepherd flooded during Hurricane Katrina. Upon returning home to Jefferson Parish in September 2005, Good Shepherd began holding Sunday worship services in the school cafeteria of John Curtis Christian Lower School in River Ridge. By October 2005, the Good Shepherd Fellowship Hall had been restored well enough to move worship services back onto our property while our sanctuary was essentially rebuilt on the inside. During this time the Rev. Gary Arndt continued serving as Good Shepherd's pastor and our congregation invited Beecher Memorial United Church of Christ to join us in Sunday worship. Beecher's church building on North Miro Street in New Orleans had suffered extensive damage from Hurricane Katrina. It was not until Christmas Eve 2006 that Good Shepherd was able to again worship inside our now fully restored and newly rebuilt sanctuary. The physical devastation caused by Hurricane Katrina was only part of the story that our church and our entire area faced. The population of New Orleans shrank drastically in the years following the storm and Good Shepherd's membership also shrank as many families opted not to return to the area. Rev. Arndt retired from ministry in 2008 and Good Shepherd was served by two interim ministers, the Rev. Ginger Taylor and the Rev. Stokes Snyder until Good Shepherd called The Reverend Dr. Randall Graf in 2010. In November 2017, Good Shepherd opted to disaffiliate from the United Church of Christ due to the extremely liberal theology and constant political activism of the denomination. Today Rev’d Graf, who has placed his ministerial credentials under the Diocese of the Western Gulf Coast of the Anglican Church in North America, continues to lead our congregation forward into new and exciting times as faithful followers of our Lord and Savior Christ Jesus, and as orthodox practitioners of the faith once delivered unto the saints.